Congratulations! Your baby has turned now 7 months. Now you need to be more attentive towards your little munchkin as he/ she has already started grasping the things around him/ her. He/ she may have probably started rolling too. 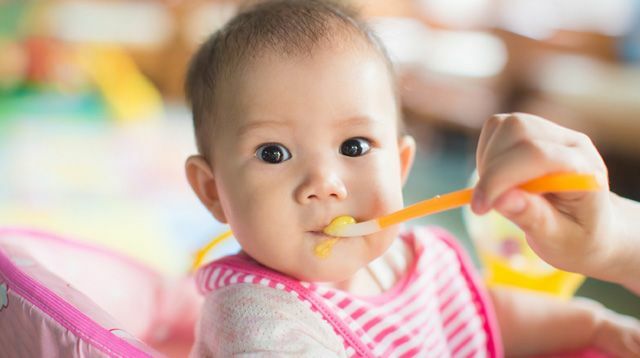 As you have already introduced the solids to your baby in 6th month, so you can continue with the foods that you have started and you can add some foods too. Do remember if you introduce some new food, then there is a 3-day rule for the same. You should give that food for 3 days so that he/ she can adapt to its taste and you will also get to know if that food is causing your baby some allergy. It must be noted that the food should be freshly prepared and don’t offer him/her raw vegetables. Vegetables and fruits should be given in pureed form to your baby. Make your baby’s food chart and follow it properly. Here are some of the important tips that what kind of food is to be given, what food should be avoided and how it should be given in your 7 month baby food chart. Freshly Prepared Food:You should always offer freshly prepared food to your baby. The food should be easily digestible to them. And do remember 3-day rule when you give new food. Pureed Food: As your babydoesn’t have any teeth so food should be in pureed form. Boil the vegetable, grind in a mixer and then it should be offered to baby as it become easy to swallow. Please don’t store pureed vegetables and fruits. Always give them the freshly made puree’s. Food without spices and sugar: Please do remember your baby’s digestive system is still developing so don’t add spices in his/her food.Sugar and salt shouldn’t be added too much. Avoid Oily food: Don’t use much of oil in the food preparation. The food should be very light.Though you can put some cow ghee after the pureed is properly cooked. Cow ghee will help to make the bones stronger of the baby. Fried food should be avoided. Whenever you will feed him, make him/ her sit upfront. Never feed when he is laying on the bed. You can make him/ her sit on the baby chair because by now he/ she may have started sitting. Fruits like grapes, dates should be avoided: Make sure that you don’t include fruits like grapes and dates in baby food chart. As your baby is not having teeth, so it would become difficult to chew such fruits and if it will not be chewed properly, it can get stuck in the food pipe. Thus, choking can happen. So, it is necessary whatever food you are feeding to your little one, you should be around him/ her all the time. Keep on giving Mother feed: Sometimes mother stop giving their feed when kid start taking solid food. Don’t make this mistake. Keep on giving the feed after every 2 hours once your baby has taken food or whenever he feels hungry. Breast milk is very important for your baby. If he doesn’t take breast milk then formula milk is preferred. Introduce Finger foods: Finger foods like tofu pieces, cheese cubes, boiled egg cubes, bread, etc. can be introduced. By this stage his pincer grip become very strong so he will ask you to give the food in his hands. Do capture the beautiful moments when he tries food on his own. You would love watching him. Don’t Give Meat: As digestive system of your baby is not so strong so don’t give meat. Also, they can’t chew it properly and digest the same. Don’t Give Nuts:Babies can’t chew the nuts and obviously it can get struck in the throat and food pipe. So,food should be given in the form of pureed only. Give soft fruits like banana, mangoes, ripe papaya:He would love to have soft fruits like like banana, mangoes, ripe papaya, etc. Never over stuff his mouth. Have patience. Moms, remember never mix two new foods together. Introduction of new foods can also cause him constipation or diarrhoea. Be careful while feeding. ← Previous Story Is Plastic Surgery a Boon or a Bane?